There's an awesome Widget out there called LinkWithin that will add a hook to the bottom of each of your posts that will display similar articles. They won't appear in your RSS, just your website, which is ok because people in RSS are already following your site and have probably already put some effort into exploring it. These hooks grab visitors attention and give them an easy way to explore other posts you've written, increasing the chance they'll become a regular reader. 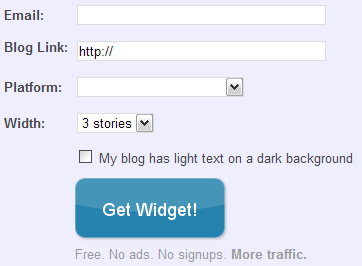 If you monitor your site stats, (http://draft.blogger.com) internal referrals from these links will show up as from "widget.linkwithin.com". In just a few days of adding it, the widget became number 2 on my Weekly Top Referral stat, within a week it's number 7 for overall referrals, which shows it's doing it's job and readers are finding more use from Wargaming Tradecraft than ever before! Just visit the LinkWithin website and sign up using the simple form located there. "6. Are there ads in the widget? How do you make money? We plan to introduce revenue-sharing features in the future, but they will be optional." My guess is they're waiting for Google to approach them with a fat cheque. I agree that this is a great tool, actually one of the best on my blog to keep readers interested. I see on my stat tracker that I get a lot of hits through linkwithin and I have people that follow my blog thanks to this tool because they see what other content I have. The only thing is that it's completely random in which other content it shows. Thanks, Dave. I've had at the back of my mind to look into this, but you've given me the push and made it all the easier. Good tool and very generous post. @Warpaintguy: I don't think it's random... I don't always understand it, but my Back 2 Basics posts do tend to show other B2B links, and so on. @Others: yeah, I saw a number of people using it, and it seemed like a great idea, so I tried it out a while ago.. It really is a great way to show people what else you're up to. Thanks Dave, what a great suggestion! I hadn'g got any idea how this gadget was called, neither how to install it. Thank you so much.